Following two back to back Test series defeats in New Zealand and in Australia has resulted in Dinesh Chandimal losing the captaincy to his deputy Dimuth Karunaratne and the national selectors making several sweeping changes in the 17-member squad named for the two-Test series tour to South Africa starting on February 13 at Durban. Chairman of selectors Ashantha de Mel said that Chandimal has been rested for the South African series to enable him to regain his poor batting form. “Chandimal’s form was down and he is also mentally down. It’s not that we dropped him but we thought of keeping him out of this series so that he can play some domestic cricket and get back to the team. In the past 10 innings he has got only one fifty. We are resting him to get him back into form,” said De Mel. In Chandimal’s absence the captaincy has passed onto experienced opener Karunaratne who will have wicket-keeper/batsman Niroshan Dickwella as his vice-captain. “Dickwella has potential and is future captaincy material. He captained the under 19 team in 2012 when I was chairman of selectors and he has good leadership qualities. When he was made vice-captain we found that his performance also improved immediately. He took on more responsibility and played better. He was on the verge of being dropped when we took over as selectors. They wanted Chandimal to keep wickets but we said no and retained Dickwella,” said De Mel. Apart from Chandimal the other players axed from the squad are off-spinner Dilruwan Perera and middle-order bat Roshen Silva – both had poor tours to Australia. “Dilruwan is having some ankle injury which he is not telling. We found that out from the selector on tour that he is taking some pain killing injections and playing. It doesn’t make sense,” said De Mel. “Also if you look at his bowling performances outside Sri Lanka he has played about 4 Tests and taken six wickets for about 600 runs and he was not effective. He is now 36 years old, and we have to build up a couple of young spinners. We hope that Akila (Dananjaya) who had gone for testing of his bowling action will be successful. By February 15 or 16 the reports should come,” said De Mel who is keen to play him in the ODIs against South Africa ahead of the World Cup. Replacing Perera is 22-year-old uncapped left-arm spinner from NCC Lasith Emuldeniya who had a fine series for Sri Lanka A against Ireland A. “He is very good. I watched him against Ireland A and he has the potential. He spins the ball and in the 21 first-class matches he has played he has taken 125 wickets. He is bowling well,” said De Mel. Embuldeniya is one of four uncapped players in the side the others are NCC’s Angelo Perera (who last Sunday became only the second batsman in history to score twin double hundreds in a match), Chilaw Marians CC’s 26-yeaer-old one drop batsman Oshada Fernando and BRC’s 23-year-old right-arm medium-fast bowler Mohamed Shiraz. Fernando is the leading run-getter in the Premier Tier A league this season being the only batsman to top the 1000-run mark. In 9 matches he has scored 1181 runs (avg. 73.81) with six centuries. 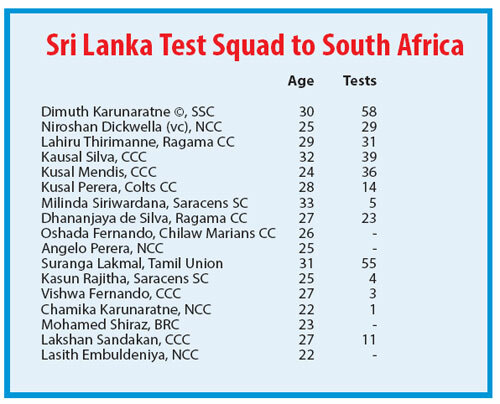 “We have left an option for six of Milinda Siriwardana, Dhananjaya de Silva or Oshada Fernando – all three can bowl. This bowler is important to keep the other bowlers fresh, otherwise they are over bowled. Especially if the spinner is not bowling well he has to bowl. Our spinners at the moment are a little inexperienced and we don’t have a Rangana Herath who has retired,” he said. “We find that we need some solid middle order batsman that’s why we picked Angelo Perera. We looked through the figures every week and he has been scoring hundreds in domestic cricket. We included him in the A squad and he got a hundred in the unofficial test at Sooriyawewa against Ireland A. “Shiraz has an easy nice high arm action and can seam the ball. We put him in the A team against Ireland A and he took 4 wickets and bowled really well. He is a guy that can hit the seam and move the ball around. He is an investment for the future,” said De Mel. Kaushal Silva is the other player to be recalled after being left out of the New Zealand series. Like Angelo Perera and Oshada Fernando, Silva has been in prolific form for SSC in the Premier league having notched up two double hundreds in compiling an aggregate of 950 for an average of 79. De Mel said that Suranga Lakmal who was forced to miss the Canberra Test due to a stiff back has been included in the squad but he will be monitored carefully as they want him fit for the World Cup. “Lakmal says he is alright but we don’t want to play him in both Tests maybe one and rest him. We are of the opinion that he is also good for the World Cup because at the top he can get wickets. The coach Hathurusingha is not keen to play him in ODIs because he thinks he doesn’t bowl well in the death overs. What we feel is that if he bowls the first overs well and can get some early wickets then you can put pressure on the opposition,” said De Mel.